If you do not know how to read musical notation, but lets say you want to learn how to jam the new Fall Out Boys song on your guitar. You will first need to learn how to read guitar tablature. Don’t worry though, because learning guitar tabs is very easy once you know all the basics. Now you will see that there are numbers written into the the staff. Each number represents what fret you push down and on what string. In the following tab example , each number is lined up on the A string (5th string) one after another which tells you that they should be played one after another. The 0 means that you pluck the A string open (without pushing on the string),1 ñ move to the 1st fret pluck, 2 ñ move to the 2nd fret, 3 ñ move to the 3rd fret. Chords are represented with numbers written on top of each other. You will notice that the 1st string (e) , and the 3rd string (G) have no numbers, this means that you do not strum those strings. They are in a basically just muted and not played. 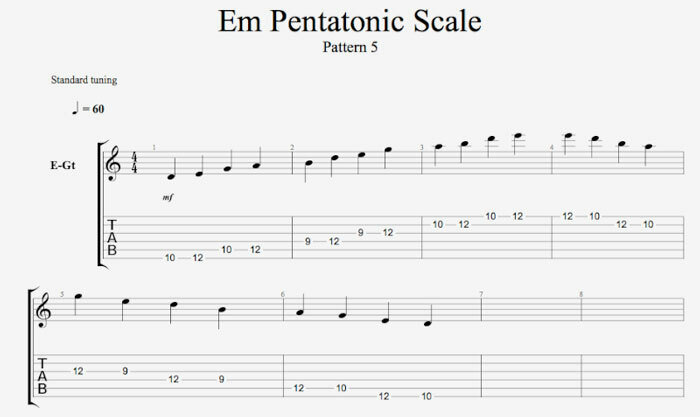 The biggest disadvantage to tablature is the the fact that you are not able to accurately define how long each not should be held for. The best way to figure this out is by listening to the actual song that you are trying to play. This is actually the best way to use tabs. You will also come across symbols that are use to represent certain actions.